The Montecristo No.1 is a beautiful creamy yet powerful cigar of Lonsdale format, of 42 ring gauge, 6.5” (165mm) long and comes in a box 10 cigars. As opposed to No.2 and the No.4, the No.1 is little known, and this is a shame because this little stogie packs a true Montecristo experience in a perfectly rolled cigar. It is also a pretty strong smoke, oscillating between a medium and a medium to full bodied cigar. It is nevertheless very creamy and smooth. There are lots of earth, cedar, tobacco flavors as you would expect from a Cuban cigar, but there are also many other flavors, such as strong nuts, all kind fruits, some citrus, chocolate, vanilla. Everything works well together; the balance of flavors is always under control. This is a cigar that worth a try, especially when it is 2 years of age. The Montecristo No.1 is a great Montecristo cigar that will please experienced smokers with its perfect construction and its complex flavor profile. •	Very complex cigar, with lots of wood, earth, nuts and cocoa flavors. •	It is nevertheless creamy, spicy with lots of fruits and citrus notes.. 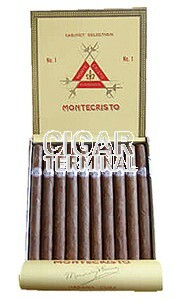 This medium to full bodied cigar is a true Montecristo that deserves more fame. The wrapper on this cigar is looking great, a nice chestnut brown color and very few apparent veins. The construction seems close to perfect, it is slightly box pressed, firm to the touch from the head to the foot, no soft spots and the triple cap perfectly rounded. It is very smooth to the touch, velvety with a nice oily sheen on the wrapper. Beautiful aromas of cocoa and caramel come from the wrapper. Once cut, the cigar reveals its perfect construction, the head is perfectly rolled, even if the draw is slightly too firm. However, it doesn’t prevent notes of chocolate, hay and earth to reach the palate. There is also a bit of saltiness and sweetness on the lips. Once lit, the first draw was typical Montecristo, lots of wood and leather. The first third of the cigar is dominated by cedar flavors, earth but plenty of different aromas add to the depth of flavors. Some fruits add some freshness; there are citrus notes, raisins, and apple. There are also a good amount of nuts, chocolate, some vanilla and some cream. On the finish, some dark coffee and some spice on the retrohale. It is very well balanced, and everything is in great harmony. The burn line is good, slightly wavy, but corrects itself. The smoke production is generous, and the ash falls by itself at the end of the first third. Overall, it is a cigar medium in strength. In the middle third, the fruity flavors come to the foreground, with more strength, the woodsy and earthy tones also pick up in strength. The vanilla and cream fade away, black coffee, earth, nuts, citrus notes make this third bolder, now a strong cigar in terms of strength. However, still very rich and complex. The final third is where the Montecristo No.1 expresses its full potential, the mix of flavors is as perfect as can be, the strong cedar is fading away, the earth is still present but now mixes beautifully with the nuts, the coffee, the cocoa and the fruits. There are still spices and some sweet tobacco notes. The strength of the cigar toned down in the final third to a nice medium-full. In summary, the Montecristo No.1 is a great smoke. It packs great flavors, a strong profile in a perfectly rolled cigar. It is a delight, strong though, but still an outstanding stogie.